UPDATED: Now there's a new poster, too! ORIGINAL POST: Over the course of his career, South Korean director Bong Joon-ho has rarely made two movies that are even remotely the same. 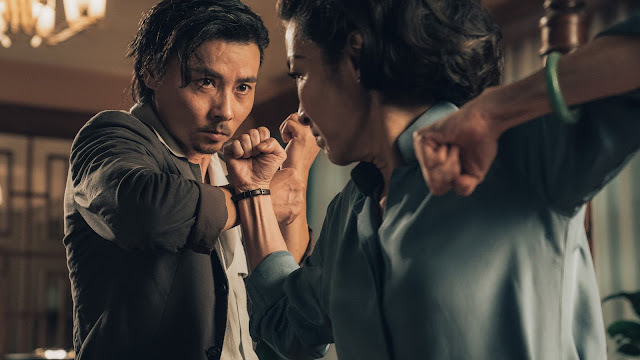 He’s done black comedy (Barking Dogs Never Bite), crime thrillers (Mother, Memories of Murder), and a post-apocalyptic actioner (Snowpiercer). Even his two creature features, The Host and Okja, couldn’t be more different in tone, style, and aesthetics. Now he’s back with another new film that looks nothing like anything he’s ever done. Check out the first trailer for Parasite. Granted, if you’re not fluent in Korean, which I am not, you’re probably missing out on some information in this trailer. That said, it definitely sets the mood and tone and hints and all manner of intrigue and potential violence. Just because all Bong’s films are drastically different, doesn’t mean there aren’t recurrent themes. Family is one that pops up in many of his movies, and that seems to be an important part of Parasite as well. The story revolves around a family where each member has “unique characteristics.” My early theory was that maybe there was a superhero-ish angle to the tale, but this looks pretty grounded and real-world—not to say that Bong couldn’t or wouldn’t twist those tropes to his own ends, but I see little evidence to support my theory. A bit more has come out about the plot, however. There are apparently two families. A young, unemployed man named Ki-taek and his family become obsessed with another family, the Parks. Then there’s an “incident” that entangles the two. From this trailer, there looks to be a great deal of obsession, unnerving weirdness, and escalating tension that probably leads to violence. Because this is a Bong Joon-ho movie, he’s put together an incredible cast. Parasite stars frequent collaborator Song Kang-ho (The Host, The Good, The Bad, The Weird, and tons more), Jang Hye-jin (Atlanta), Choi Woo-shik (Train to Busan), Park So-dam (The Priests), Lee Sun-kyun (A Hard Day), and Jo Yeo-jeong (The Target). Parasite is set for a May release in South Korea, but the rumor also has it the film will premiere at the Cannes later this year. Given Bong’s history with the prestigious fest—a number of his films have debuted there and he’s served on the jury—that’s not a bad bet. Regardless, we have and will definitely continue to keep an eye on this one.